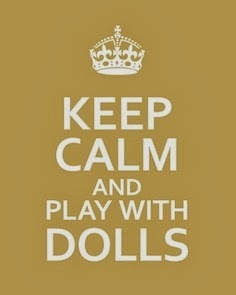 Our doll club, the cloth-a-dollics are having a challenge to make a doll that is travelling. 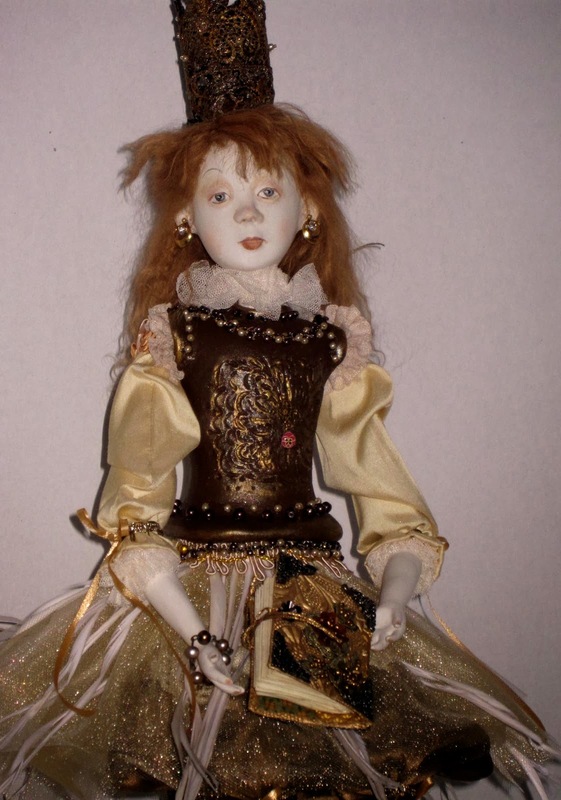 The doll should be of someone that we want to meet (past, present, or future) and going someplace that we have never been. The piece must have some sort of luggage and must incorporate the challenge fabric (mid-blue satin type of fabric that we were given). 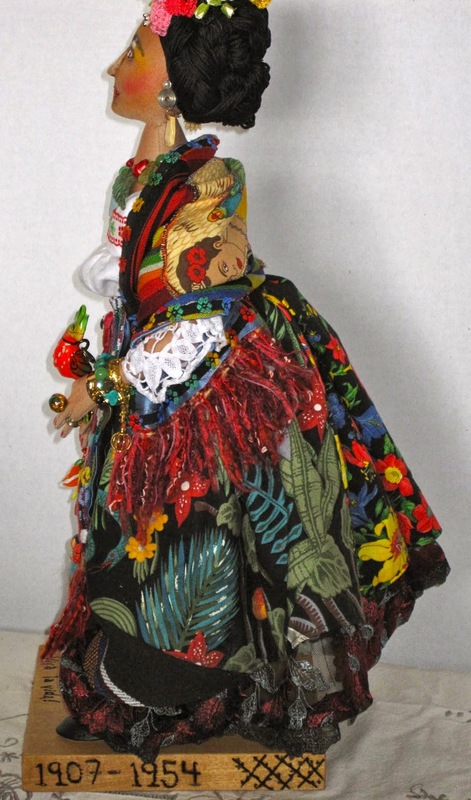 The travelling dolls are to be displayed at the Victoria Quilt Guild's show on May 2-4th at the Pearkes Arena here in Victoria. The quilters also have a challenge that involves travelling-they are to make a travel quilted bag. 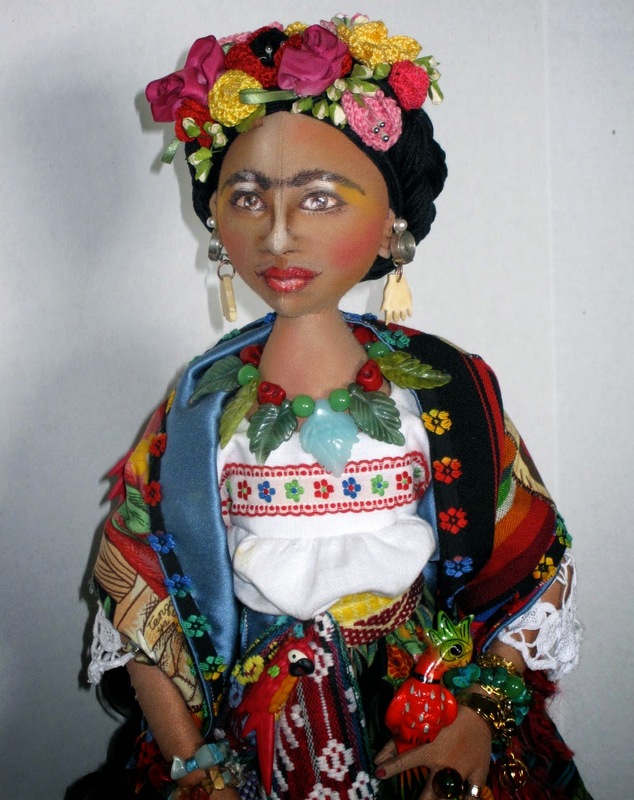 As soon as I heard about the challenge I thought of making a Frida Kahlo doll travelling to Paris to display her surreal art work. I was very pleased with the result. 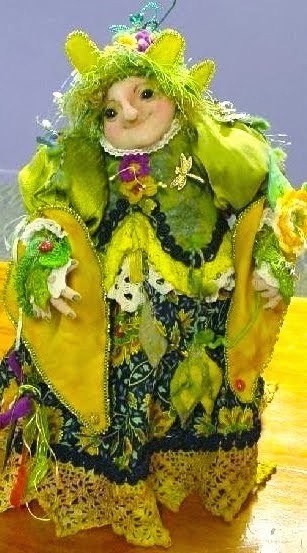 The doll is about 18" in height. She is saying goodbye to one of her parrots before her travels. 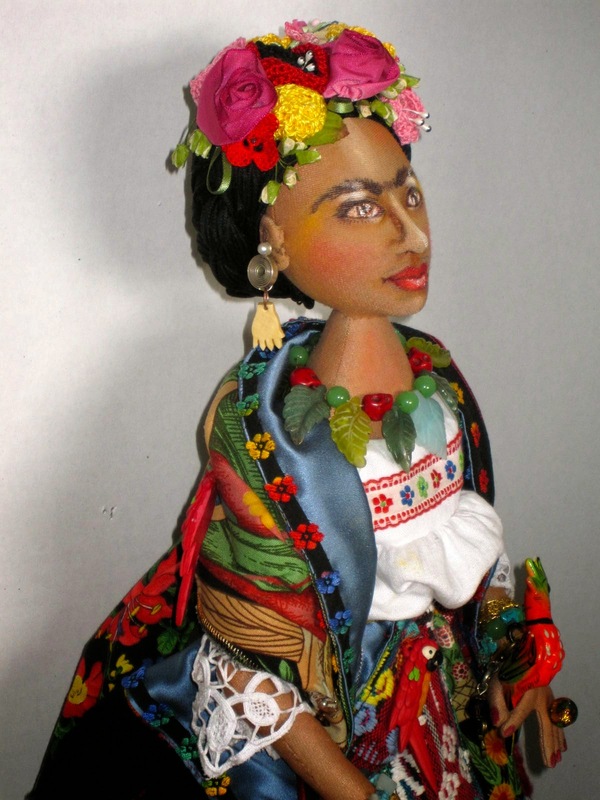 Frida was a remarkable women that was beset with both great pain and great joy. Frida loved to paint her face. She began seriously painting after a severe accident when she was sixteen up to her death in 1954 at the young age of 46. Frida's arresting paintings, most of them self-portraits express her pain and struggles in the surrealist style that she called "her reality". 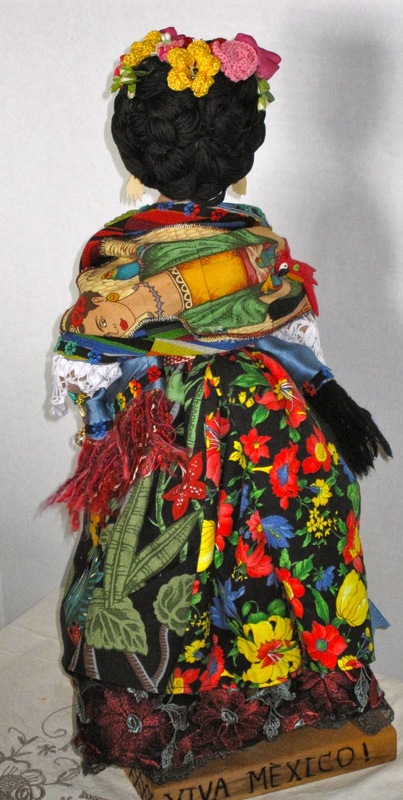 She loved Mexico and loved the traditional Mexican folk art and the "day of the dead". 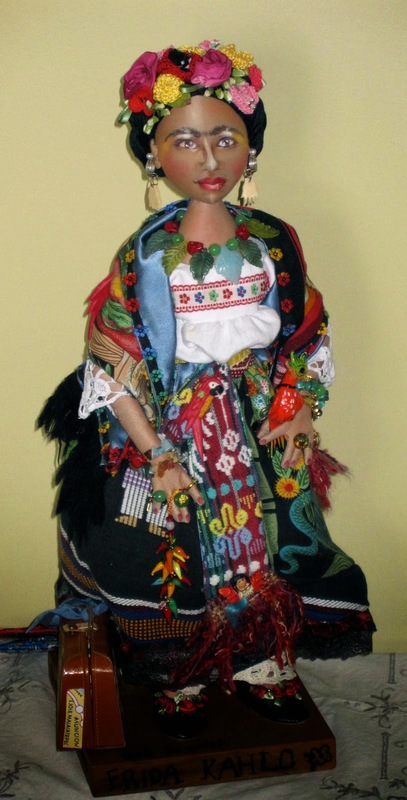 This doll is based on her paintings. The hand shaped earrings she wears were given to her by Picasso. 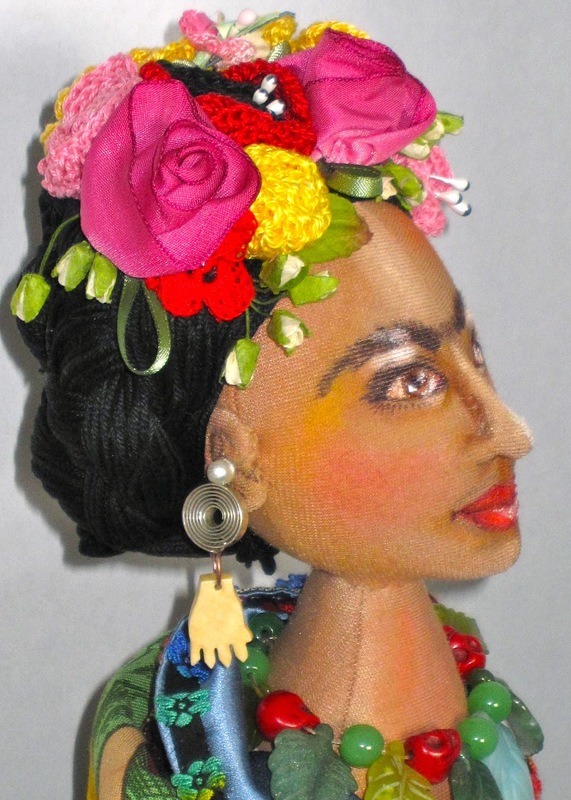 Frida loved to wear her joy of life on her body and she often wore lots of jewellery and flowers in her hair. She loved nature and animals and often painted herself with parrots and monkeys. Notice the blue fabric that I used for the lining of her shawl (that was the challenge fabric). For her outfit I was fortunate to be given some traditional Mexican/Peruvian folk fabric by a very lovely lady named Connie. This depicts her luggage with Mexican stickers. 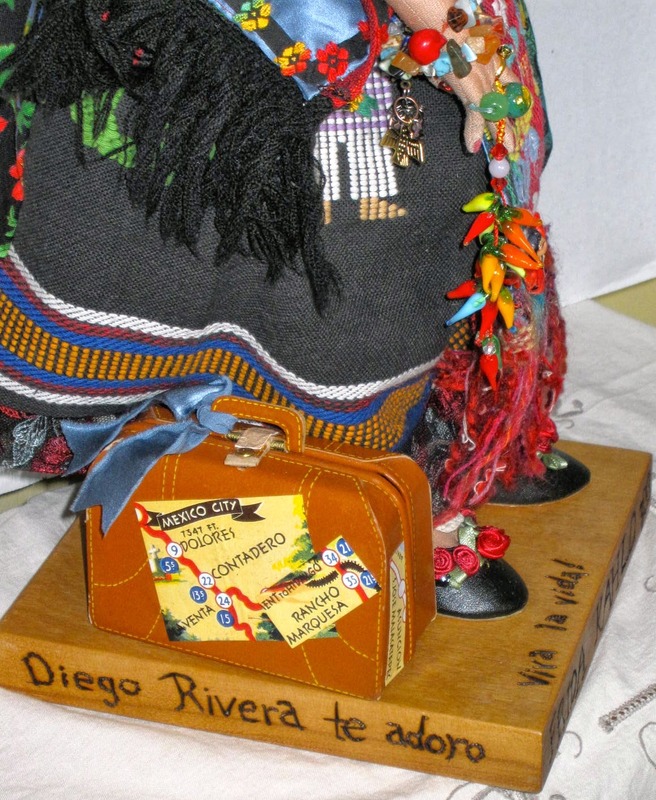 I burned the words "Diego Rivera the adoro" into her base. Diego was the love of her life but their relationship was very rocky as Diego could not remain faithful to Frida. Despite this, they loved each other fiercely and could not live long apart. The next few pictures show the "day of the dead" cards (the side of playing cards) that are at the base of this piece. The Day of the Dead is celebrated in Mexico to honour the dead relatives. I picked these particular cards as Frida was born in 1907. 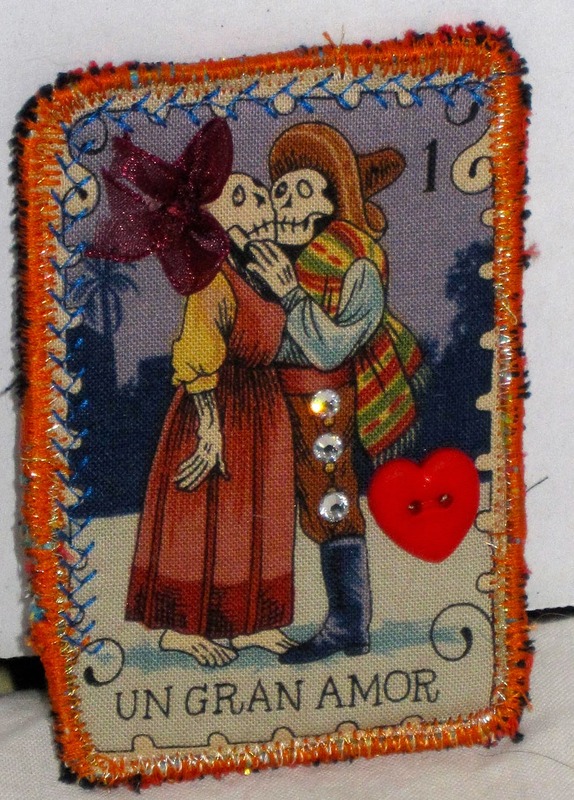 This card depicts the great love of Frida's life, Diego. Frida did have many lovers in her life besides Diego (including some women) but she could not live without Diego. One last look at this renowned Mexican artist that achieved a global reputation. In 1983 her work was declared the property of the Mexican state. 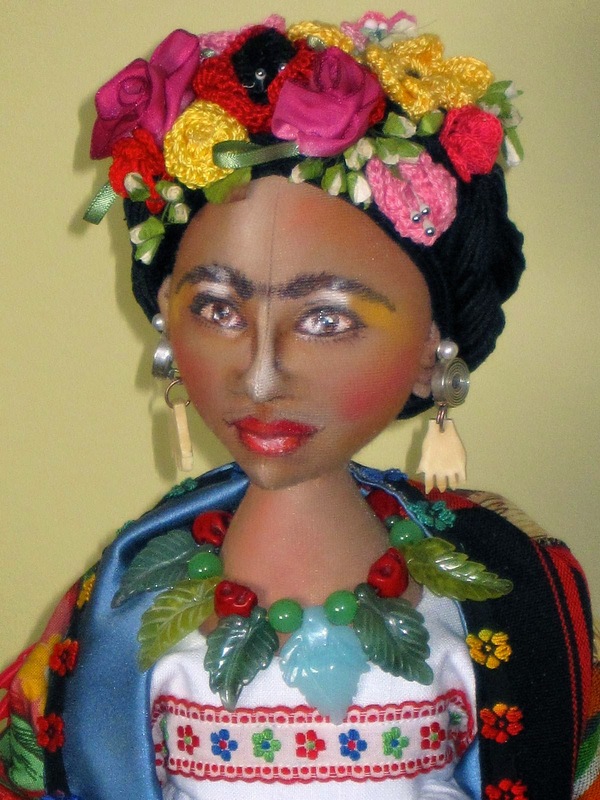 I hope you enjoyed Frida and if you are in the Victoria area, please come to the Pearkes arena on May 2-4 to view the quilts and dolls! I wanted to post this to pay tribute to the work of the Dutch Touch dynamic duo, Ankie Daanen and Marlaine Verhelst. Ankie told us about their history together which dates back more than 30 years! 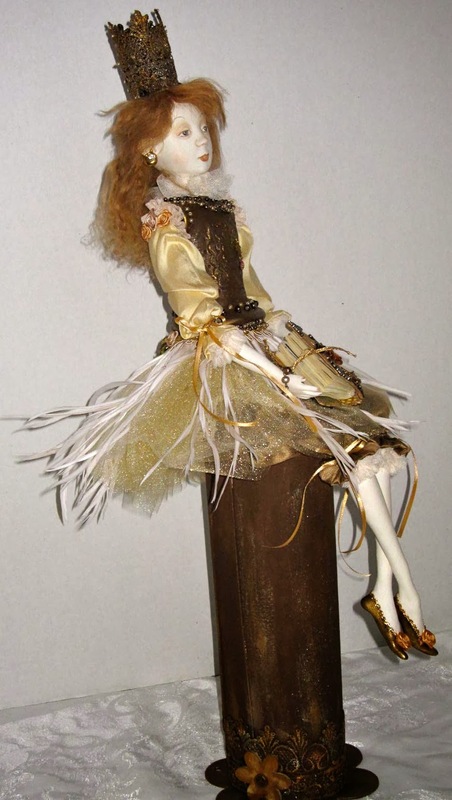 Ankie went to an international doll show and fell in love with art dolls. She went back to the same show three, four times trying to take it all in. She then went home and searched for teachers in her area and came across Marlaine Verhelst. 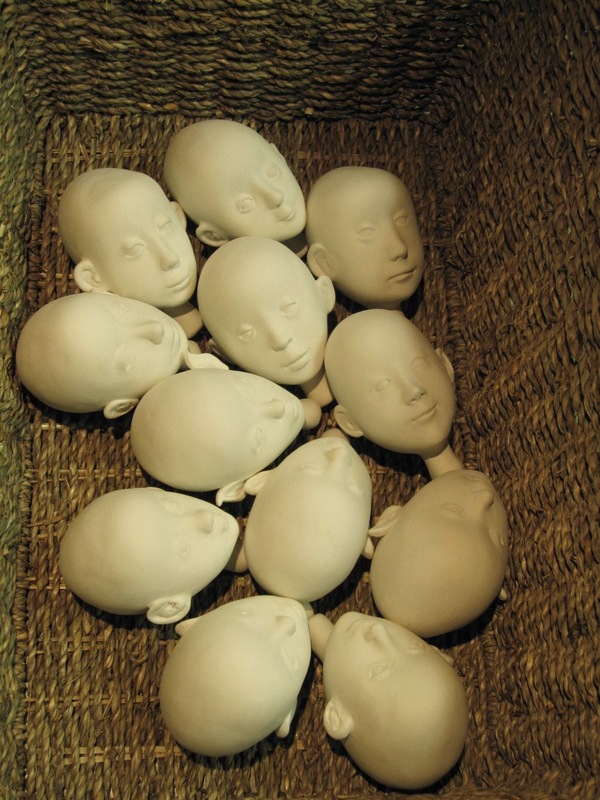 She immediately contacted her and took her first doll sculpting classes. They became instant friends. 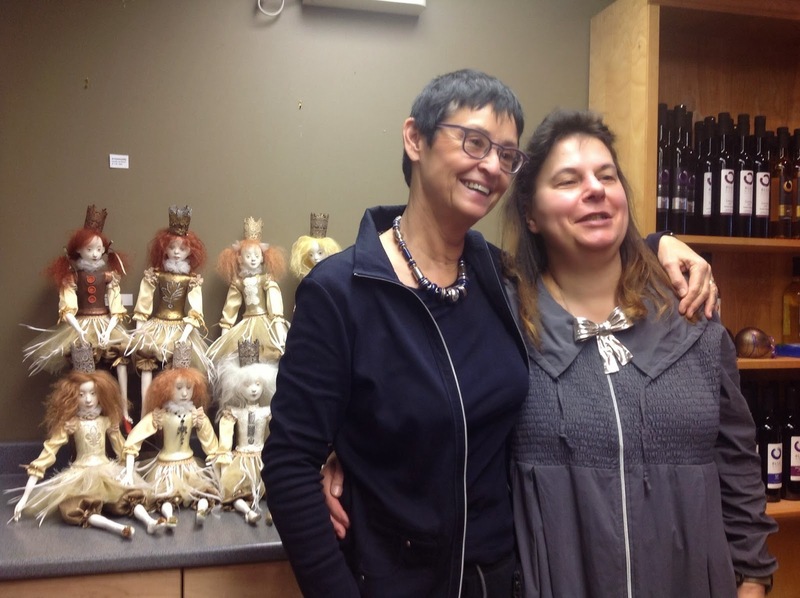 Both of these ladies have gone on to become master doll makers with international success. 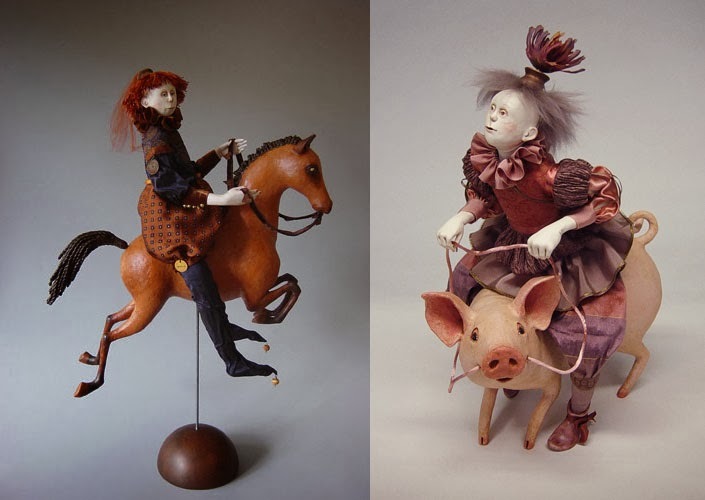 Both were selected to be members of NIADA (National Institute of American Doll artists), a select group of international doll artists of all media that are chosen to promote the art of doll making. Their dolls are similar and yet so different, each with character and personality. 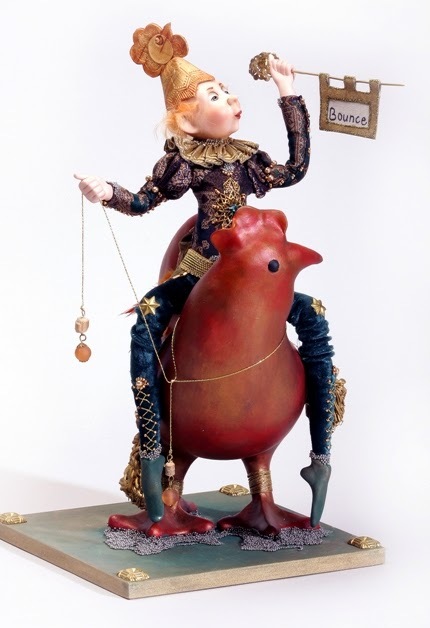 Although Ankie was Marlaine's student, they both developed their art in Holland while remaining friends and feeding off of each other's work while developing their own style. 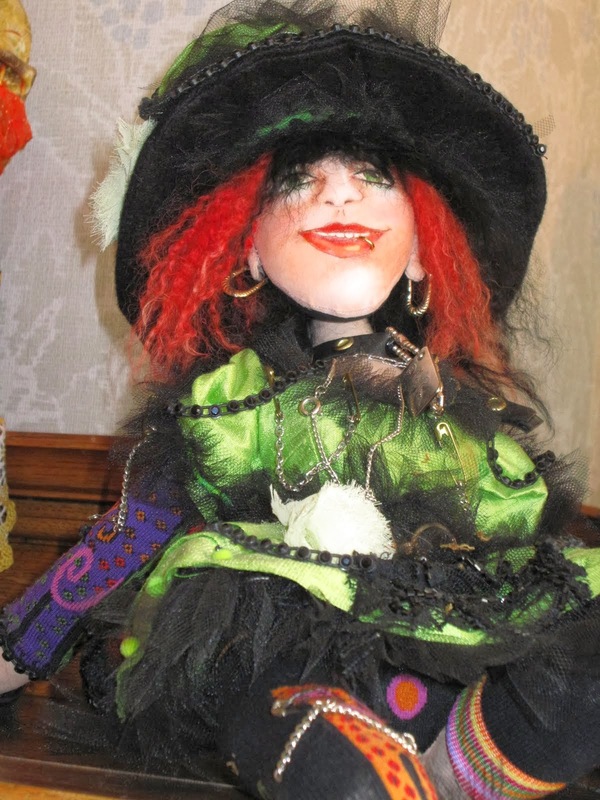 Ankie tends to make dolls with elaborate costumes while Marlaine seems to enjoy dolls paired with animal friends. If I were to have to choose I would want one doll from both these wonderful doll artists but I would not know how to choose just one from each artist! 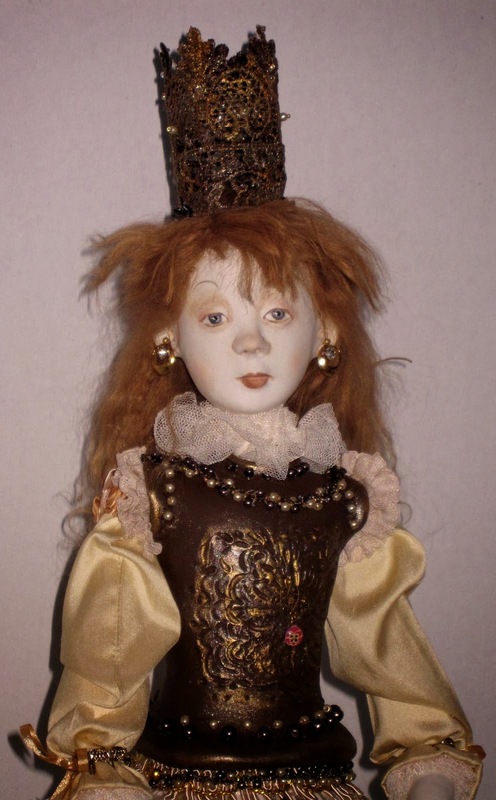 Sadly, I know first hand how difficult it is to remain friends in the same small market that is the world of art dolls without being jealous of your friend and without doubting yourself and feeling threatened by their success. I was so impressed with these ladies as not only teachers but more importantly as women to admire and to emulate, two friends that can work with each other and bring out the best in one another while inspiring their students to do the same. 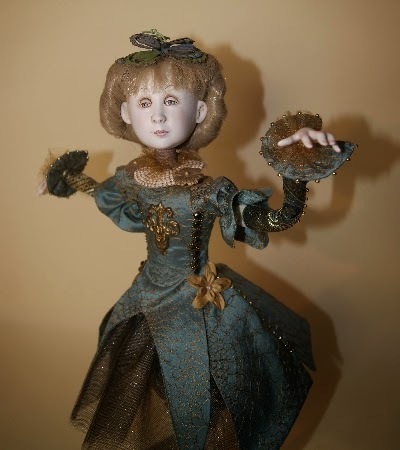 My hats off to you and I do hope that in my life I too can bring out the best in others and inspire my fellow doll artists, after all that is what life is all about! As promised, I am presenting Princess Sophia, made in a workshop with the New Dutch Touch. I decided that being an Italian Princess meant that Sophia needed earrings, so I pierced her ears and gave Sophia gold and diamond hoops. The princess decided to wear her pearls and her bracelet for her portrait. In addition, she wanted a wee bit more trim around her sleeves and pantaloons (she is innocent, but a wee bit demanding). She asked for tiny gold trim at the edge of her shoes, and I gladly obliged. Finally, Princess Sophia was thinking back to her wonderful week at the Blue Moon Winery in Courtenay, BC and she was missing her "sisters in spirit" so I decided to make her a royal art book filled with pictures of the other Princesses. She was so delighted that she now holds her book on her lap and will not let it out of her sight! 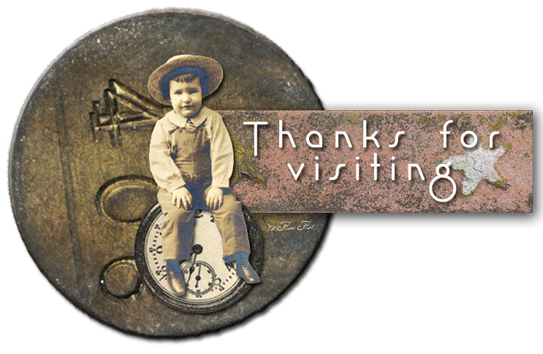 I hope you enjoy my little Princess, I know I do and I hold the memories of my week in Courtenay close to my heart. 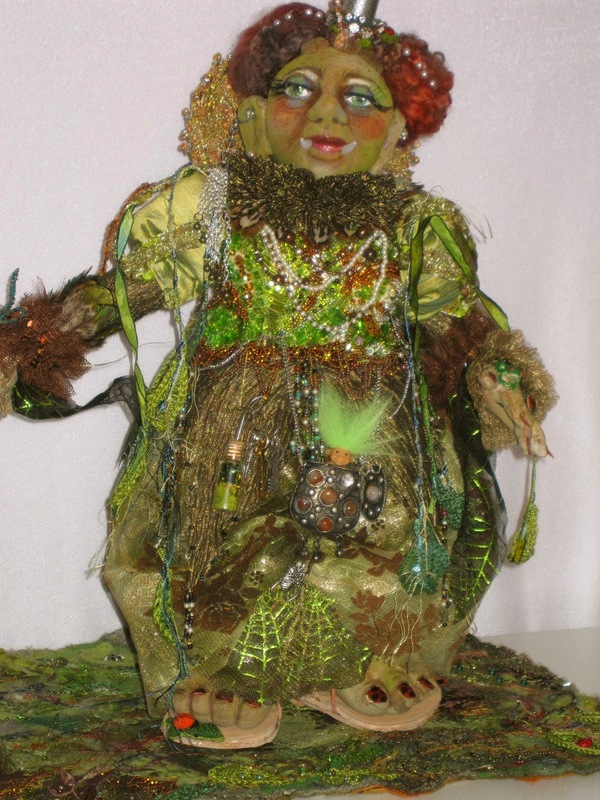 I am so excited that I just finished a glorious week learning from Ankie Daanen and Marlaine Verhelst along with 11 other enthusiastic doll makers! The week was organized by Marla of Blue Moon Winery in Courtenay, BC on Vancouver Island. The weather was typical west coast with gentle rain and gray skies (normally it is much drier at this time of year) but nothing could dampen our fun. Ankie and Marlaine were such fun and very good teachers. We started with an oval ball that was covered in a thin layer of paper clay and then we started to build our "little princess". This is a fairly new class for them and is a departure from the emphasis on heavy costuming. 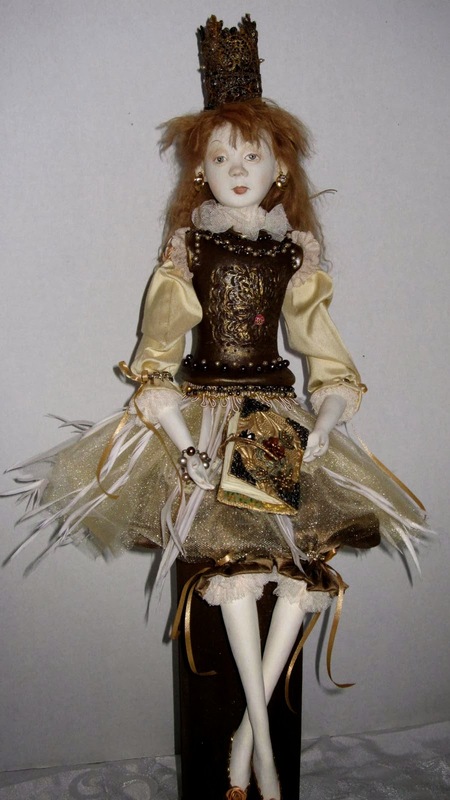 This doll has a paper clay bodice that can be decorated and painted as part of her outfit. As you can see, although we were following the same steps for building her face, all the heads are unique depending on the slight differences in the size and placements of the features, just like us! 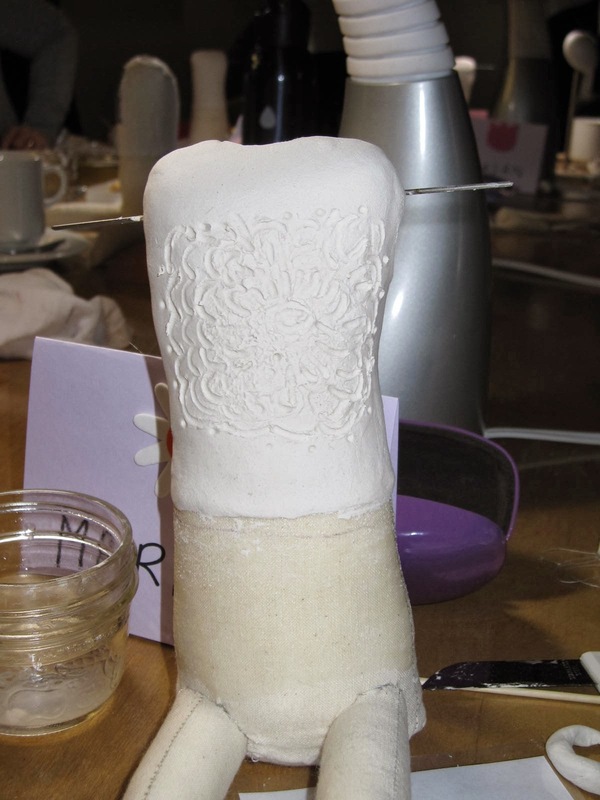 The paper clay was fun to work with as it was supple and could be smoothed with your own fingers and water. We did have paper clay tools that we used as well. The most challenging part was learning how to build slowly by adding clay and them smoothing well to blend the added clay into the face. The little hands were the hardest part for me! The bodice was easy and fun to decorate. Some of us used a stamp to emboss the clay, others a piece of lace and still others embedded metal bits into the bodice so that they would adhere once the clay dried. 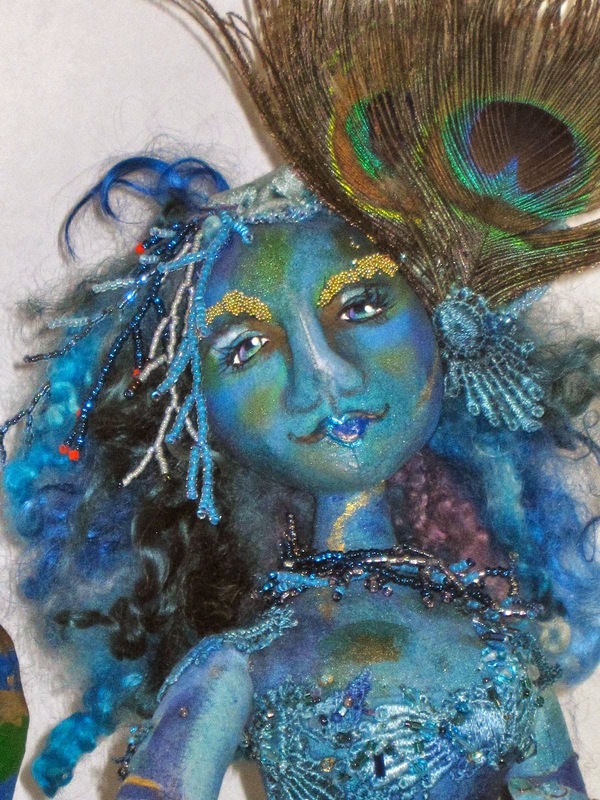 I cannot describe the fun and positive energy that I received from spending an entire week immersed in creating a little doll with like-minded ladies! 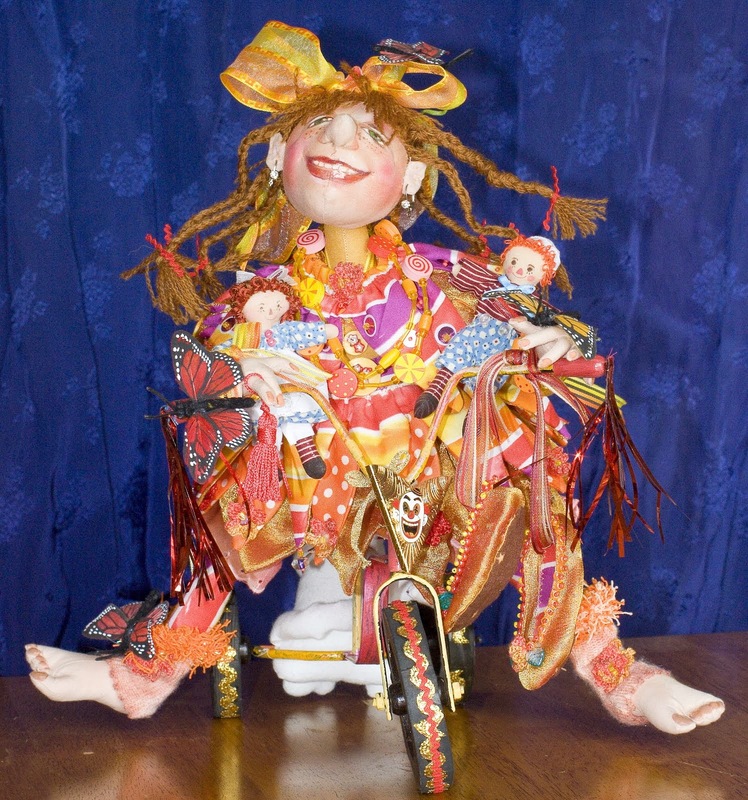 Marla, our host was so gracious and showed us her past work and her wonderful marionettes. Snacks, tea and coffee were available all day long and a local chef, Laura made us the most tasty lunches using organic, local produce. Marla provided her local berry wine. This is my idea of heaven, creating, laughing, eating and drinking surrounded by the positive energy that is in all of us! Here is a group portrait of the little princesses: They once all lived in the same magical kingdom and then met their special someone and moved a little bit away to a castle of their own making. The little princesses were determined to connect at least once a year with their sisters in spirit and share their varied and eventful lives in the peaceful setting of Vancouver Island. I will add my little princess' solo picture a little later as soon as she receives her special book and necklace so stay tuned! Marla plans to have Ankie and Marlaine back in 2016. I can hardly wait! Bye for now.